Mynachlog-ddu (SN143306) is a village and community in the Preseli Hills, Pembrokeshire, Wales. The community includes the parish of Llangolman. The Welsh placename means "black monastic grange": before the Dissolution of the Monasteries, the parish belonged to St Dogmaels Abbey. Mynachlog-ddu sits on a plateau 200 metres (660 ft) above sea level between Carn Menyn (365m) and Foel Dyrch (368m) in the Preseli Hills. Mynachlog-ddu and the surrounding Preselis are rich in prehistoric remains. It is one of the possible sites of the Battle of Mynydd Carn in 1081. By c.1100 it was under the control of the Normans. Much has been unenclosed moorland since mediaeval times, with few houses. The village developed as housing for slate quarry workers and there has been a chapel in the village since 1794. The population of the parish in 1821 was 447. Carn Menyn is presumed to be the source of the bluestones used in the inner circle of Stonehenge. In 2000/2001 a project was established to try to transport a piece of bluestone from the village to Stonehenge. The project ended when the stone sank in the sea. It was lifted out a few months after, but the project was never resumed. A comedy based on the idea of a campaign to have the bluestones returned Bringing Back the Bluestones premiered in Pembrokeshire. There are two places of worship in the village: the Anglican church (Church in Wales) of St Dogfael (sometimes, Dogmael), and Bethel, the Baptist meeting house. The poet Waldo Williams was a pupil at the primary school (where his father was headteacher) between 1911 and 1915, where he learned to speak Welsh. Dutch officer and Colditz POW (and escapee) Damiaen Joan van Doorninck spent his retirement in Mynachlogddu and died there on September 24th, 1987. ^ "Community population". Retrieved 20 April 2015. ^ Charles, B. G. (1992). 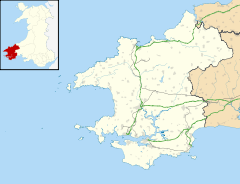 The Placenames of Pembrokeshire. National Library of Wales. p. 124. ISBN 0-907158-58-7. ^ Landranger 145 - Cardigan and Mynydd Preseli. Ordnance Survey. 2007. ^ "Dyfed Archaeological Trust - Mynachlog-ddu". Retrieved 16 June 2014. ^ "GENUKI:Mynachlog-ddu". Retrieved 23 March 2015. Wikimedia Commons has media related to Mynachlog-ddu. This page was last edited on 11 May 2018, at 20:52 (UTC).